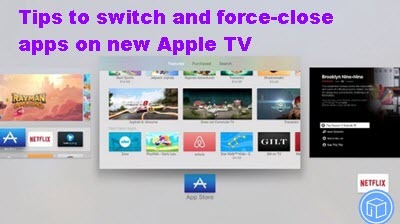 Last time, I have introduced some tips and tricks to help you better use Apple TV and today, I will share another new tips to help you to quickly switch and force-close apps on your new Apple TV. Multitasking on the new Apple TV is more iOS-like than ever, thanks to the inclusion of a new dedicated home button on the Siri Remote that functions largely identical to the iPhone and iPad, according to AppleInsider. The revamped Siri Remote retains the Menu button from the previous Apple Remote, but also gains a new home button to its right. While the Menu button takes users back one menu within an app, the Home button is a quick and easy way to return to the tvOS home screen, where apps can be found. But jumping back to the home screen isn't necessary for switching apps: Just like on an iPhone, users can double-press the Apple TV Home button to pull up a list of recently opened apps. All recently opened Apple TV apps are presented in a pop-over menu from left to right. By using the Siri Remote trackpad, users can scroll to the right to quickly jump to their favorite app. In another feature brought over from iOS, users can also swipe up on the trackpad when an app is selected to force-close the app. As with the iPhone and iPad, some apps will intelligently run in the background to complete tasks, and Apple offers the option to force close them to fix potential problems when an app may be stuck or has crashed. Also, you can quickly put the Apple TV to sleep using the new Home button. Just press and hold the button on the Siri remote and tvOS will present the option to put the set-top box to into sleep mode.